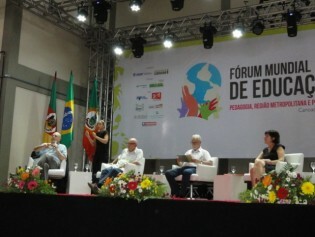 The challenges of the digital age call for schools to develop an alternative model of education, with teachers who incorporate new technology and employ a more critical pedagogy, participants said at the Fórum Mundial de Educaçao (World Education Forum) in this southern Brazilian city. Healthcare for Brazil’s indigenous minority is in poor health, according to U.N. experts, missionaries, social workers and native people themselves. Indigenous communities in remote areas of Brazil have begun to recognise that they have the right to not be hungry, and are learning that food security means much more than simply having food on the table. A new social contract is needed in education, that would fully incorporate informatics and the 21st century conception of human rights, French professor Divina Frau-Meigs says in this interview with IPS. March will be a key month for defining the future of the Inter-American human rights system, which has come under fire from a number of countries in the region. The tragedy at the Kiss nightclub cast a dark shadow on proceedings at the Thematic Social Forum held in Porto Alegre, the southern Brazilian city renowned for hosting the first World Social Forum in 2001. At 8 a.m. on Oct. 25, 1975, Brazilian journalist Vladimir Herzog voluntarily reported to the São Paulo headquarters of the government's intelligence agency and was never seen alive again. Announced as an innovative way to encourage the participation of Internet users and the public in general in the debates at Rio+20, the proposal for Sustainable Development Dialogues also raised doubts about the impact its recommendations would have. Decent work is an essential requirement for sustainable development, the central theme of the Rio+20 summit, taking place in a country where slave labor has yet to be eradicated. In this southern Brazilian city that has an international reputation as a pioneer in environmental policies and citizen participation, the city government has set an eviction date for the small protest movement that is occupying the central square. Traditional social movements of homeless and landless people have for years been organising occupations as a pressure tactic. Now "occupying" is a key element for fighting the capitalist system in its hour of crisis, and also in the realm of virtual reality. Critical voices raised against what was dubbed "the gospel of green capitalism" resonated in every discussion and street march held during the Thematic Social Forum, which brought thousands of activists to the capital city of the state of Rio Grande do Sul, in southern Brazil. Activists gathered in Brazil from around the world doubt the political will of governments to attack the root causes of the environmental crisis, and demand drastic changes in the system of production and consumption. Even before he was hired as spokesman for the Wikileaks whistleblower web site in July 2010, 49-year-old investigative journalist Kristinn Hrafnsson realised that the new initiative would have the power to bring about transformations simply by informing society, starting in his own country, Iceland. José Luiz Ferreira, 60, was born poor and is still poor, but was able to get an education. Known as Seu Luiz (Mr. Luiz) in Vila Nova Chocolatão, the Porto Alegre neighborhood where he lives, he earns a meager living by giving English classes. And he sees eagles where everyone else sees chickens. The adoption of a new Forest Code in Brazil could threaten efforts to curb Amazon deforestation, which was reduced 70 percent between 2004 and 2010. Proposed amendments to the Brazilian Forest Code raise new alarm over Amazon deforestation. In Panama's largest cities, minors under 18 not under supervision of an adult must be off the streets after 9:00 p.m. The juvenile curfew law means some spend several days behind bars until someone shows up to pay the fine. In the weeks since a motorist mowed down dozens of cyclists in the southern Brazilian city of Porto Alegre, the incident has becoming a rallying flag in the fight to create a more bike-friendly city. A motorist’s attack on a group of cyclists in Porto Alegre has drawn local and international attention to the cause of bicycles as a mainstream means of transportation.